In my work with foundations over the past decade, it has become clear to me that, while there are lots of effective and well-intentioned board members out there, it’s easy for foundation boards to get lulled into complacency and slip into bad habits. Here are what I regard as the 7 Habits of Highly Ineffective Foundation Boards, drawn from CEP’s research on governance but also from my own observations – having met with dozens and dozens of foundation boards. 1. Assuming success in philanthropy is as simple as success in business. This habit, often fueled by the business press, is as widespread as it is damaging. A failure to recognize that philanthropy is, almost by definition, working on the toughest challenges – the ones that business and government have not solved – leads to all kinds of problems. Here is a sampling: Unrealistic expectations, failure to see that success takes time and patience, casting about for a “silver bullet,” and a reductionist and ultimately unhelpful approach to performance assessment … which leads me to my second habit. 2. Not doing the hard work of overall foundation performance assessment. Boards often ask unrealistically for a single ratio by which to gauge programmatic performance – failing to recognize that no analog to share appreciation or profitability exists in philanthropy (see Habit 1). When that isn’t offered up by staff, because it can’t be, board members throw up their hands – perhaps gravitating instead toward that which is more easily quantified and compared: endowment performance and administrative cost ratios. CEP’s research has documented the fact that foundation CEOs actually want their boards more involved in assessment, but to get there they and their boards need to buckle down in a way that many don’t. Good foundation performance assessment requires clear goals, coherent strategies (rooted in solid logic), and a set of indicators that tie to strategies. It requires investment: financial investment as well as the time necessary to learn about the programs on which the foundation works. It requires an “indicators” approach – a recognition that a variety of data sources need to be tapped to answer the deceptively simple, but all important, question: How are we doing? 4. Believing their foundation’s resources are vast relative to the problems being addressed. Foundation boards tend to overestimate the resources of their foundation, focusing on asset size rather than payout (“we’re a billion dollar foundation!”) or, even when focusing on the payout, failing to properly contextualize the number. Almost inevitably, a foundation’s resources are slim relative to the problem being addressed. This makes both focus and collaboration key if goals are to be achieved. As Joel Fleishman and Tom Tierney put it in their book, Give Smart, “One of philanthropy’s great ironies is that very little can be accomplished by individuals acting on their own, even when those individuals are extraordinarily wealthy.” The same could be said of institutions, and boards are wise to remember this. 5. Not learning from history. Harry S. Truman once said, “There is nothing new in the world except the history you do not know.” As I recently discussed in a blog post on Olivier Zunz’s important new history of American philanthropy, this feels particularly true in philanthropy. So much of what is positioned as new – from “collective impact” to policy and advocacy work to a focus on root causes – is nearly as old as American philanthropy. Why does this matter? Because we can learn from that history. Ignoring past successes and failures benefits no one except perhaps the burgeoning field of philanthropic management consultants – too many of whose business models are built on selling “new” frameworks and approaches that are, in fact, demonstrably very old. 6. Believing it is the board’s fiduciary responsibility to discuss and approve every grant. Many boards get so bogged down in considering individual grants that they never look up and ask what it all amounts to or how it’s all coming together. Grants get discussed in the absence of clarity on goals and strategies, and, ironically, more resources are wasted than if the board delegated more grantmaking authority to staff – but with greater clarity about the criteria and logic that should guide them. Boards need to clear the time for important discussions about goals and strategies, and that requires giving up on discussing each $25,000 grant. 7. Over-managing and over-scripting meetings. Too many foundation boards, aided and abetted by staff, over-manage and over-script meetings such that the most spontaneous thing to happen is someone standing up to get a refill on a coffee. 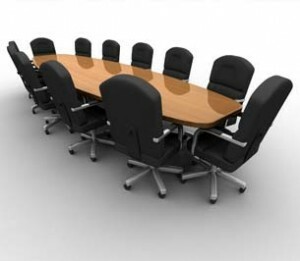 Collegiality gets valued over debate – indeed, the Chair and CEO often try to pre-wire everything such that no real dissent and debate occurs at the full board meeting. This leads to board meetings that add little value and, incidentally, are also utterly dull. (As Patrick Lencioni points out in his book, Death By Meeting, one of the reasons people hate meetings – and tune out during them – is that there is no drama. Not the bad kind of reality-TV drama but the good kind of “I’m not sure how this is going to turn out” drama.) Often, an inner circle makes the tough decisions in advance, leaving the rest wondering what their role is. Important debates that could elucidate issues and lead to new insights either don’t happen or don’t see the light of day and, as a result, decision-making suffers. We’ve seen in our research on foundation boards that the boards that see themselves as most effective are the ones that value respectful dissent – among board members and between board and staff. Foundations are unique in our society, as so many philanthropy scholars and observers have noted, because of the freedom they enjoy. That freedom can be a tremendous asset: liberated from the pressure to satisfy customers or shareholders or win voters, foundations can take on the issues other actors in our society can’t or won’t. But it can also be a huge liability: foundations can coast along, making little difference, sometimes even cultivating an aura of effectiveness on the conference circuit along the way. The board, and perhaps only the board, can tip the balance in terms of which way a foundation goes. Staying away from the bad habits I have described can help assure foundations make the most of their opportunity to make a difference. This blog was written by Phil Buchanan, president of the Center for Effective Philanthropy (CEP), and was originally posted on the CEP blog.